Kunini is a well-established, versatile Electrical, Lighting and Solar PV Specialist. We take on the entirety of any project right from beginning to end. We will manage and oversee every element of the project for the customer, from the initial planning through to completion. One of Kunini’s strengths is our ability to seamlessly integrate Electrical, Lighting, Smart-Home Systems into one easy to manage package. Kunini will design and install all structured cables required for any technical system, such as; Security, CCTV, Multi-Room Audio, Networks, Intercoms and the like. All of this is looked after under one single contract and all through only one company / contractor, Kunini. This negates the laborious task of having to deal with a multitude of companies and contractors for each different element of the project. You have just one single point of contact, that’s us, Kunini. Kunini began our business installing intruder and fire alarm systems in 2002, over the past fourteen years we have constantly reviewed and revised our product portfolio to include a wide spectrum of electrical and electronic products required either for a luxury villa, home resort, apartment, hotel or commercial property. We keep ourselves completely up to date with the latest and greatest advancements in technology to ensure we are always delivering the best options to our clients. Over the years, we have gained a vast amount of experience with a variety of different systems and their associated integration methods with other products. The in-house management team at Kunini work very closely with all of our clients. This is to make certain that the packages we put together, incorporate a design which encompasses all of the systems that are to be installed. We use our extensive industry experience and knowledge in newer technical advancements to ensure that at the start of the process,we are able to fully advise our clients of the different options that are available to them.This allows for us to then create a design collaboratively, which enables everything to be accounted for in one go. One of the many ways in which we are able to ensure a cost effective solution and guarantee our high quality service, is by not outsourcing any of the work, we keep it all in house, whether it is project design, cabling, systems installations or other. Another of Kunini’s strengths is our ability to design and install a wide range of energy saving solutions. When we design a project, we are able to specify the entire electrical system, whether it be for a residential or commercial project. This is quite unique because our clients can choose at the beginning to install the infrastructure (cables & conduits) for all systems possibilities during the construction, but can then choose the “Systems” at a later date. At Kunini, we are always looking ahead. We take into consideration the possible future systems by installing additional UTP Cat5 or Cat6 cables throughout any project. This can help save significant money further into the lifetime of the property as it negates the requirement of another install at a later date to upgrade cabling. At Kunini we design and install our electrical systems to the high quality British standards using the current IEE Wiring Standards 17th Edition as our guideline. We also follow IEC and TISI standards. Once the final design is complete and has been approved, Kunini will apply the design to auto cad and prepares working and as built drawings throughout the project. When we complete any project, a full set of documents are always presented to the client. These include an ‘As Built Electrical Plans in CAD, an Installation Certificate, full Load Schedules for all boards (marked and labeled), and a two year warrantee certificate. At Kunini we have the experience and knowledge to take any concept and turn it into a design and then to reality. All of our work is fully backed up by a two-year warranty. A full consultancy package is available. If you are looking for a reputable partner for your next solar, electrical or lighting project then look no further than Kunini! Talk to our friendly team today to find out how we can help you. Kunini was founded in August 2002 in Koh Samui, Thailand. The initial aim was for Kunini to offer quality security solutions to Koh Samui’s rapidly growing community. In the early days, Kunini was known as Kunini Security. It was decided that security was to be removed from the name after transformation of the business from Security to Electrical and Lighting Contractors in 2009. 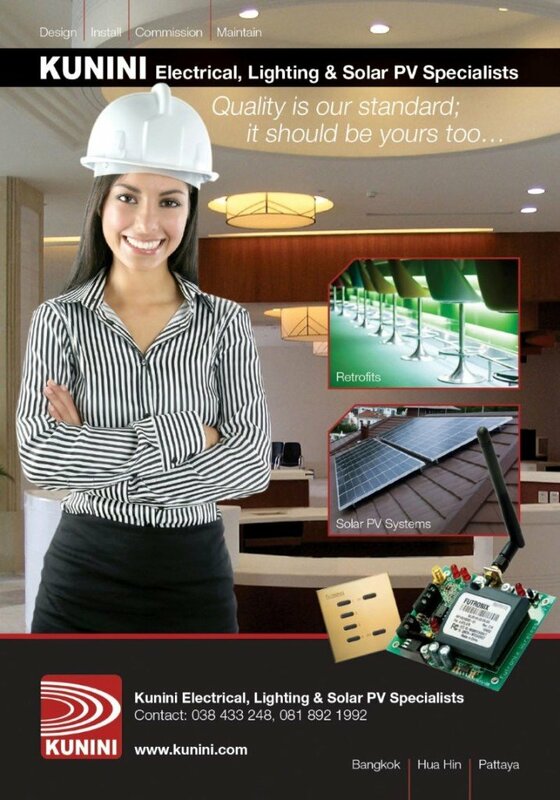 The business started out as a small operation offering quality security systems; alarms, CCTV, access control and other related products.The property market in Koh Samui stared to rapidly expand, so Kunini started to research other popular technologies and services that could be incorporated into their product line-up allowing them to assist their customers with a more expanded product offering for their projects.